This embroidered apron (husu) forms part of a small group of Korean court garments bought in 1919 from the Reverend Stanley Smith, a former Christian missionary in Seoul. Taken together, they display something of the pomp and ceremony of court life at the end of the Choson dynasty (1392–1910). 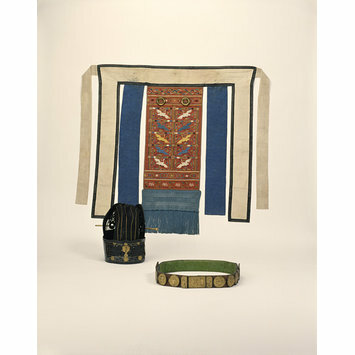 The apron, designed to be worn at the back, would have accompanied a hat and belt as a court costume. They would have been worn for the regular royal ancestral rites at the Royal Ancestral Shrine. Two vertical rows of white, blue and yellow cranes are embroidered on the red ground of the central panel. Cranes have important symbolic significance in the art of Korea and may represent wisdom in this case. The central panel is embroidered with two vertical rows of white, blue and yellow cranes on a red ground, attached to a surrounding band of white silk with black edging. Made of red silk, this panel (husu) is embroidered with a cloud and crane design, and have golden pendants, suggesting that this was used by officials of the first and second ranks. The embroidered panel is sewn to the belt (daedae), which is made of white silk and outlined in black. 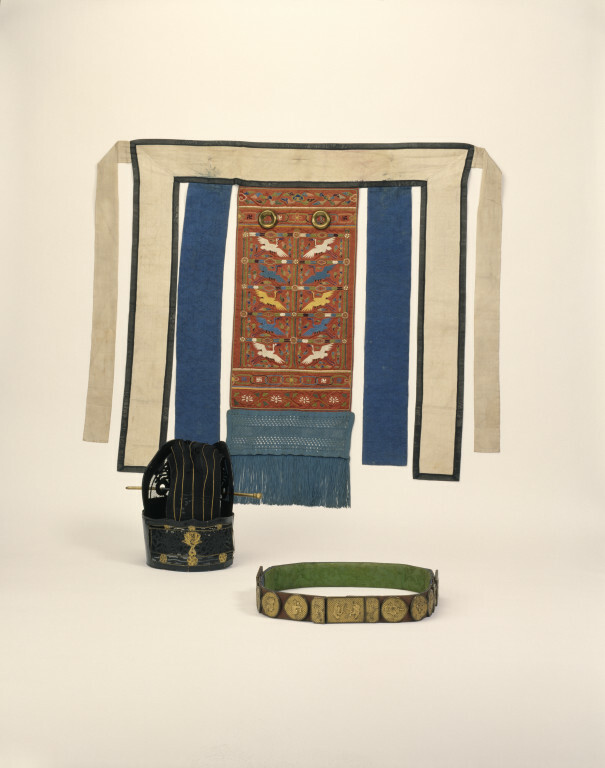 Two strips of blue cloud-patterned silk brocade are also sewn to the belt. "The Samsung gallery of Korean Art at the V&A.". Birds, Bats & Butterflies in Korean Art. National Research Institute of Cultural Heritage. Daejeon: National Research Institue of Cultural Heritage, 2013, p. 292.